Making concrete involves mixing dry cement, which is known by the generic term portland cement, with water. Pouring dry cement out of bags generates dust. That dust contains hexavalent chromium, a compound that irritates the skin and produces burns and rashes. Beyond the immediate dangers from handling cement and inhaling its dust, long-term effects include the development of allergic reactions. Hexavalent chromium is a toxin that is harmful to the skin. It is classified as a potential occupational carcinogen by the NIOSH, or National Institute for Occupational Safety and Health. In addition to an increased risk for lung cancer, the Centers for Disease Control and Prevention (CDC) lists other health effects as occupational asthma, nasal irritation, respiratory irritation and nosebleeds. It creates a larger danger when the cement is wet as opposed to dry, but dry dust still is harmful to workers and anyone exposed. Skin allergies result from allergic reactions to hexavalent chromium or chromium itself. These allergies affect the skin causing rashes and skin ulcers to develop. Exposure to concrete dust occurs over time; many workers will not exhibit any skin allergies for years only to have a reaction develop suddenly. Once an allergy occurs, the amount of dust necessary to trigger the reaction gradually lessens. At some point, only the smallest amount will cause the reaction; at that point, the worker's allergy is lifelong. He can never work with cement and concrete again. Hexavalent chromium causes an allergy known as occupational asthma. Symptoms include difficulty breathing and wheezing. Its cause is the long-term exposure to dry cement dust. It begins with irritation to the nose, mouth and lungs. Difficulty breathing and a cough develop in later stages. It resembles asthma but is caused by the dust. Precautions to avoid developing allergies and to contain active ones include wearing a good pair of alkali resistant gloves along with long-sleeved shirts and long pants. Pull sleeves over gloves and tuck pants inside boots. 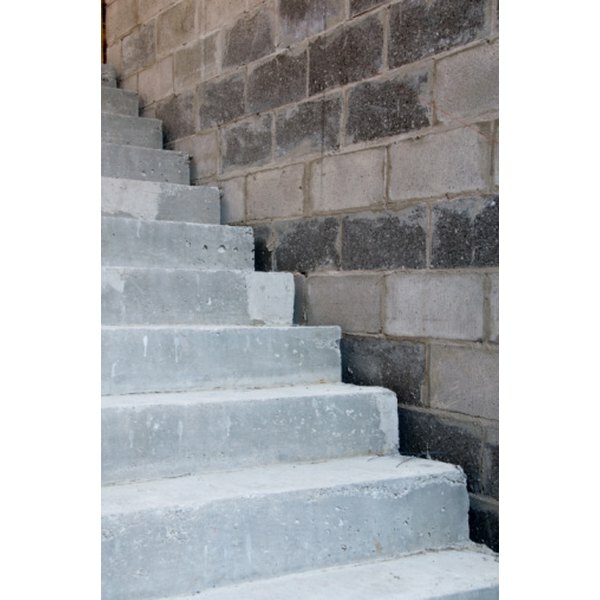 Wear waterproof boots to avoid contact with wet cement. Wear goggles with side shields to keep dust out of the eyes. Wear respiratory equipment when exposed to cement dust, either from bags of dry cement or broken pieces of concrete. Keep adequate ventilation in work areas.